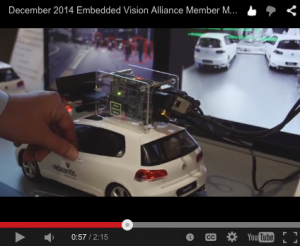 At the Embedded Vision Alliance member meeting in December, we were given the chance to give an overview of videantis, and display our demonstrations. We showed our pedestrian detection implementation, based on the Histogram of Oriented Gradients (HOG) and Support Vector Machine (SVM) object detection algorithms. In addition, we showed a Structure from Motion (SfM) implementation that extracts 3D depth information from a standard 2D camera. The SfM algorithm was developed by our partner VISCODA. It was another great member meeting, with more participants than ever, and very good talks by other member companies and industry analysts.